Microsoft Corp.’s Office 2013 is still the top choice among workplace productivity tools, although cloud-based email is steadily gaining some ground, according to a new study from technology and market research firm Forrester Research Inc. Releasing its report on Oct. 15, Forrester polled about 155 IT decision-makers back in July. 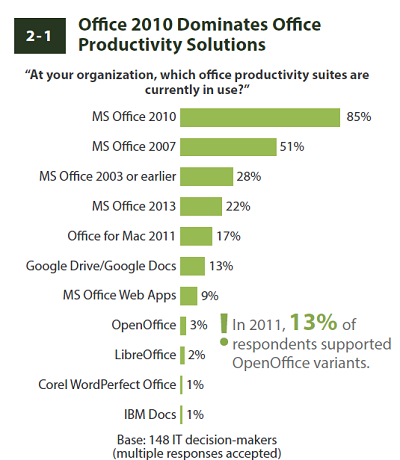 It found above all else, about 77 per cent of respondents want their solutions to be compatible with Microsoft Office. To them, that’s more important than having mobile apps, collaboration features, or integration with collaboration tools. And less than 10 per cent of people polled said their organization had an alternative to Office for their co-workers. (Image: Forrester Research Inc.) Click for larger image. However, that being said, Google Docs and Google Drive seemed to have gained traction over Office Web Apps, even though more organizations were using Office 365 than Google Apps. 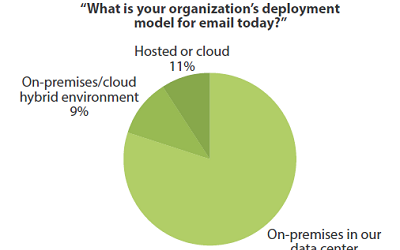 Still, cloud-based email seems to be moving on up. 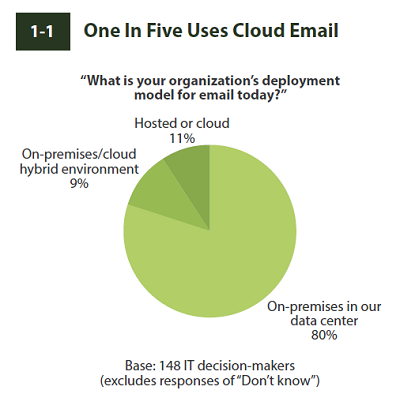 Half of the organizations surveyed have a number of employees still accessing their emails from on-premises servers, but another 25 per cent said they planned to start using cloud email. “IT pros complain that they are paying for an office productivity suite with a lot more functionality than most employees need. Web mail represents a step in changing how firms work,” wrote Philipp Karcher, the author of the report. The report went on to say that for the most part, on-premises collaboration using Microsoft is by far the option of choice for most organizations. About 78 per cent of companies in the survey are using Microsoft Exchange Server, and 82 per cent are running SharePoint Server. That put Microsoft Exchange far ahead of competitors like IBM Notes. With all of this mind, the Forrester report indicates there hasn’t been much room for open source alternatives. 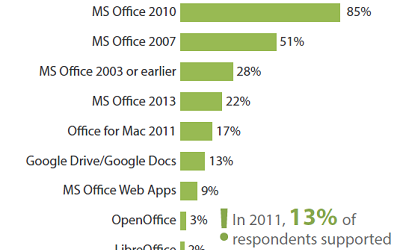 In its last survey, conducted two years ago, Forrester found 13 per cent of those polled said they were supporting at least one variant of OpenOffice. Now, that number has dropped to about five per cent. “OpenOffice and LibreOffice are still serviceable lightweight alternatives on the desktop, but they have been overshadowed by web-based tools that differentiate with superior support for mobile devices and collaborative document editing,” Karcher wrote. Still, for bigger organizations, Microsoft Office isn’t going away any time soon, Karcher added. A major reason for that is employees don’t really want change – it’s only IT departments that are pushing for a move away from Office in favour of something cheaper, he wrote. “Microsoft Office already is the consumer leader. Many employees have been using Microsoft Office all their lives at home, in school, and at work. If they wanted to use alternative tools, they could – and some do choose to complement or replace their use of Office with alternatives,” he wrote. Although some employees do go for free consumer options, like Google or Apple iWork for the new iPhone, it may take some time before Microsoft Office loses its status in the workplace, he said.